Glasgow Tigers manager Stewart Dickson admitted his team were just not good enough as they lost 54-36 to Premier League leaders Edinburgh Monarchs. 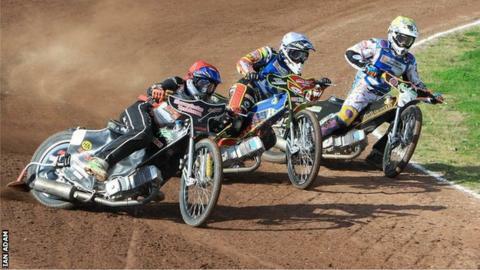 The Tigers' east coast rivals also beat them on Friday to end their hopes of reaching the play-offs. "It's disappointing. Edinburgh were just too strong for us in every department," said Dickson. "I didn't get the track just as grippy as I wanted but I think that's just papering over the cracks." Tigers captain Theo Pijper earned 14 points in Sunday's match and Kasper Lykke battled to a score of eight, but they were just about the only high points for the home team. Dickson added: "They were just leaving us for dead out the start and when they didn't, they seemed to go by us as well. "There were a couple of battling performances from our guys but unfortunately it wasn't good enough - end of story." The Tigers' sole target now is the Knock Out Cup. They take on Newcastle away on Monday in the first leg before the return at Ashfield in two weeks' time.